The history of the town of Olive will be the topic of the Orange County Historical Society’s general meeting on Thursday, March 8, 2012. Speaker and OCHS board member Daralee Ota will discuss the area’s early pastoral days; the rancho lifestyle of the Yorbas; the bustling, boomtown era when Olive boasted a lucrative flour mill; the citrus era; and Olive’s development into a modern residential community. Daralee’s program will be based, in part, on her Web site, “Olive Through the Ages,” (http://dragoon1st.tripod.com/olive/). The program will begin at 7:30 p.m. at Trinity Episcopal Church, 2400 N. Canal St. in Orange, and is free to the public. In the 1800s, the area below the bend of the Santa Ana River (what is now a part of northern Orange), was known by several names, including Yorbas, Santa Ana (before the modern community of Santa Ana was founded), Old Santa Ana, Burruel Point, Olive Ranch, and eventually Olive. Although Olive never became its own city, many still identify themselves as Olive residents. Daralee launched her Olive Web site when she found very little information about the community online. Having grown up near the area and wondering about this town that faded away over the decades, Daralee began researching Olive in 2004, amazed to discover its rich and vast history. A few years ago, she added “The Living Branch” section to her Web site to share even more information about Olive’s history, including stories, maps, and images contributed by individuals with a personal interest or connection to Olive. Submissions of photos and other relevant content are welcomed for possible inclusion in this portion of the Web site. 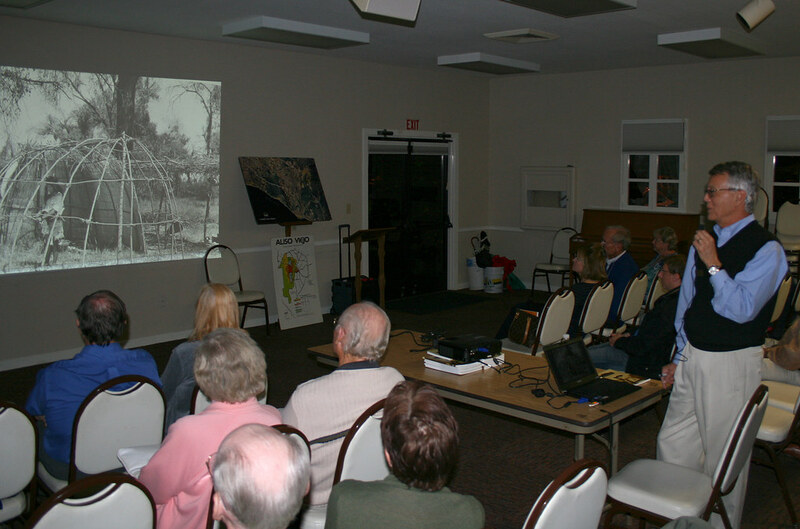 The birth and early development of the communities of Mission Viejo and Aliso Viejo will be the topic of the Orange County Historical Society’s general meeting on Thursday, February 9, 2012. Bob Bunyan, President of the Aliso Viejo Community Foundation (AVCF), and former executive with the Mission Viejo Company, will give us his first-hand account of the creation of these master-planned communities that once were grazing lands for cattle. The program will begin at 7:30 pm, at Trinity Episcopal Church, 2400 N. Canal St., in Orange. The free program is open everyone interested in history, so invite a friend. Mr. Bunyan has served as President of the AVCF since 1999. Previously, he was a vice president in charge of sales and marketing with the developer during the acquisition, planning, and development of properties within Aliso Viejo. Prior to that he worked with the Mission Viejo Company helping to plan and build the Mission Viejo community. He continues to be engaged in the completion of the Aliso Viejo master development plan, and through the AVCF, is also involved in the city’s affairs and activities. Like Mission Viejo, not too many years ago, the area now called Aliso Viejo was a working ranch. The land had changed little since Mexico granted it to Don Juan Avila in 1821. The Moulton family bought it over 100 years ago and formed the Moulton Ranch. In 1976, the Mission Viejo Company, purchased the last acres of the ranch for the planned Aliso Viejo community. The first residences were sold in 1982 and the burgeoning area became Orange County’s 34th city in 2001. This is a unique opportunity to hear from someone involved in the evolution of both Mission Viejo and Aliso Viejo. The story of how they went from ranchos to growing towns to modern cities should be fascinating. January 2012 Meeting Program – Show and Tell – Speaker: You! Coming January 12, 2012 will be another of the interesting “Show and Tell” programs. That means it’s time once again to rummage around your house and garage to try and find a choice artifact or bit of ephemera that tells us something about Orange County’s past. These items can run the gamut of historical significance. Maybe you have a handbrake from a Pacific Electric car or maybe great-grandpa’s branding iron is stored in your attic. Your search may find an outstanding photo of early Orange County that hasn’t seen the light of day in years. Now’s your chance to trot out those curiosities that you’ve stashed away—if you can remember where they are. There will be more details in next month’s Courier. But if your storage is anything like ours at the OCHS, we wanted to give you a head start. The OCHS office and archives is regularly open on the last Saturday of every month from 10:00 am to 2:00 pm. Board members will be available to assist you with your research questions and help you discover what materials we have. If you need more information or are interested in becoming a volunteer, please contact us at info@orangecountyhistory.org. To help support our yearlong 100th celebration, we ask you join the Centennial Circle. The Centennial Circle will include limited edition memorabilia, invitations to patron only programs, your name on our Centennial Plaque, and more from January to December 2019. You can become a Centennial Circle patron for $100.00 per person. Our Centennial Circle Patrons will help with associated costs of our special programs. © 2019 Orange County Historical Society. All rights reserved.